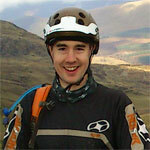 I have been looking at singlespeed mountain bikes for a while trying to decide what I would buy when I had the chance. I’ve had a hard time deciding whether I would build one up and should therefore start acquiring parts on the cheap or if I would get a complete bike which would make the parts stockpile redundant. A 2013 Cannondale like Dandy’s was an early candidate for it’s price and style but I could see a lot of things that might need upgrading very soon, for example getting tubeless compatible rims and hydraulic brakes. When I got wind that Dave was building up an El Mariachi frame things started to click into place – Salsa offer a full bike option with a nice package of functional parts. 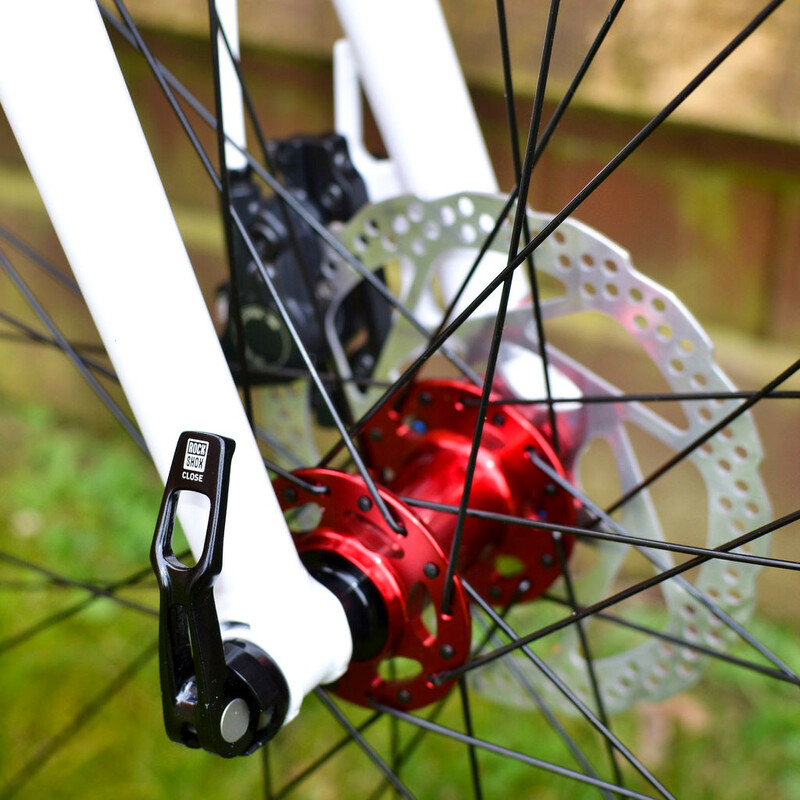 You get Shimano Deore brakes; a 15mm bolt through steel fork; great singlespeed dropouts and a frame with no hose stops for gears; Stans Rapid rims (like an OEM version of the Arch rim); and UK sensible Schwalbe Nobby Nic tyres. The bike arrived very well boxed, although requiring significant assembly of the front end. I would never have chosen the white paint and red anodising colour scheme but it is very effective in an understated way. A lot of the finishing kit is Salsa’s own which helps with the quality feel. I was surprised by the 110mm stem length which is very much against the trend on a 2014 bike. I assume the length and 30mm spacer stack underneath it are tuned to the size of the frame (this is XL), in any case I decided to run with it and make my own mind up later. The bars are tolerably wide at 700mm with an 11 degree backsweep which looks weird to me but feels okay. The crankset is a low-budget thing cast as a triple and then blanked off so not very pretty. The brake hose guide on the fork is a C-clip rather than a proper screw in which I would have liked to see, speaking of which there are no clips with the bike and the rear brake hose is zip-tied on – it deserved better I think. Both the Maxle fork on the front and the alternator dropouts on the rear look very tidy and you can see what the extra money gets you over other singlespeeds on the market. I measure clearance at the front to be 88mm across the top of the tyre so I think it would fit a 29×3.0 Knard if you wanted to although Salsa say no. The rear should fit a 2.4 tyre. I am not one to spend a lot of time on bike setup so I just set the approximate seat height and set off. For my first 29er ride it felt quite playful, I think it is helped by being a singlespeed which encourages a bit of attack, and the rigid fork provides very precise geometry. The short chainstays tuck the back wheel right in under the seat and with a relatively steep head angle it has the same overall length as a 26” bike. The top speed was an early disappointment on flat and uninteresting sections as 32:18 only gets you to about 20 kmh at a reasonable cadence. I suppose the answer is either to fit a higher ratio or choose more challenging routes. Although I chose it for many utilitarian reasons I really look forward to riding it in a sort of no-nonsense just get out kind of way. The purity of a rigid singlespeed is refreshing although I still find myself going for the imaginary trigger shifter when the track heads downhill. 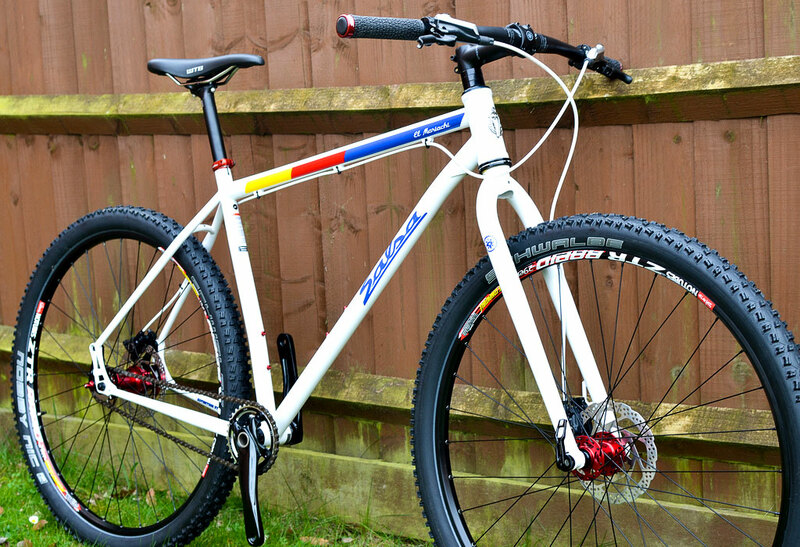 I am not sure if it has too much trail chatter going downhill – I have yet to set it up tubeless and sort out the right tyre pressures so it is probably running harder than I need it right now. Potential upgrades are limited to the contact surfaces right now, it might get ESI grips and higher spec 2.35 Nobby Nics depending on how I get on. Salsa’s tagline for the bike is Singlespeed / Singletrack / Bikepacking would I agree with that? I thought that I would and I do like 1 gear; I like as much singletrack as I can get on any bike; and bikepacking… well I would if I got the chance! I’m liking the red ano myself and think it works well together as a package. Big tyres certainly seems to be the way to go and the 2.35 Nics worked well on my rigid Inbred and now on my suspended El Mariachi. It’s nice riding something different as well. Anyway, enjoy the SS experience. Charlie the Bike Monger does a bell that you can position to ring every time you go to change gear! I think the trend for these 29ers to have short back ends and larger head tubes exaggerates the aggressive, forward-looking stance of the bike; which is also reflected in the way they handle. Your fine looking El Mariachi is another example of this function dictating form. As I mentioned in my ‘dale review, and as you’ve discovered, the lack of a mech and jockey wheels, combined with a rigid fork that won’t dive, allows an immediate response when stopming on the pedals giving that ‘playful’ feel. I quite like the look of the bike, with the yellow/red/blue colours making it look a bit like a Mondrian painting. 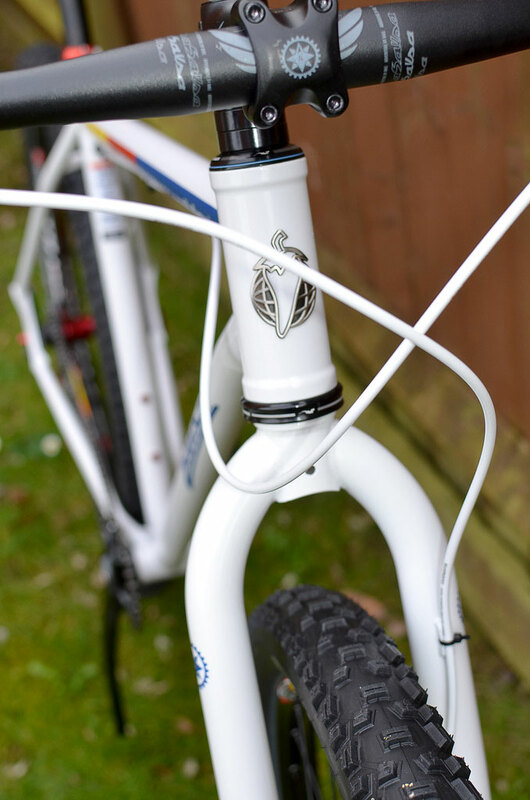 Nothing compare to my white and pink Inbred though which is about to get a new identity (and the Kona too!). Dave’s El Mariachi looks great too, the best feature of this model is the versatile dropouts. I love the bolt through rigid fork too. I wonder if you could make a Knard work up front, might be worth trying Dandy’s as Salsa are most definite it won’t fit (in an Oi! NO!! sort of way!). It must be very flat where you are Andrew if 32:18 is too easy on a 29er. My experience of the Surrey Hills on a singlespeed is 32:18 on a 26er and that feels about right round here. Do I need a different alternator drop out if I’m having my Mariachi SS converted to Geared set up? Hi Steven, yes you just need a replacement for the drive side dropout plate.